I know I'm getting to this a little late in the afternoon, and due to that, we're going to make this short and sweet. I'll try to cover most notable percentages and notable recordings, but we'll pass on some of the detail this time around. 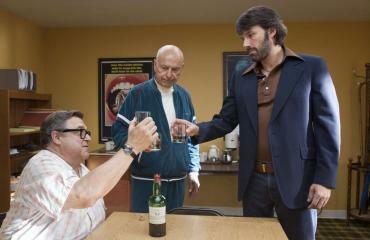 At the box office this weekend, "Argo" surprisingly took the top spot. This was the third weekend for the film, yet the first weekend in managed to grab the umber one spot. With new titles hitting theaters like "Cloud Atlas", "Silent Hill: Revelation", and "Chasing Mavericks", it seemed likely that one of them would step up and claim the victory. That wasn't the case though as each film fell well low of any expectations. Both "Cloud Atlas" and "Silent Hill: Revelation" managed the top five, but barely. Both the studios and fans of the respected franchises surely had more in mind for their gains this weekend. 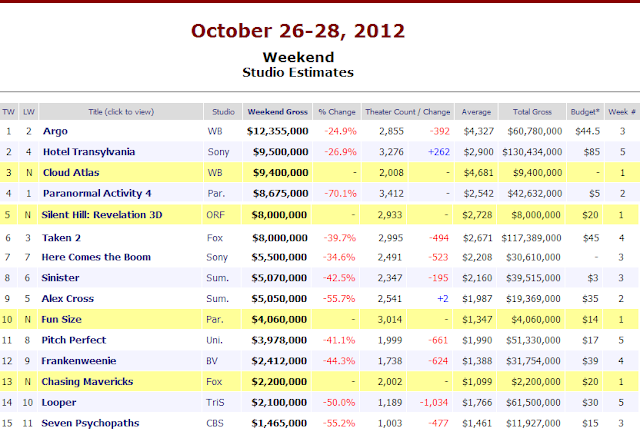 "Argo" took the top spot this week, again with incredibly low drops. Down only 24% from last week, it made $12.3MM this weekend, bringing its domestic totals up to just over $60MM. With its $45MM budget, it's now well past that mark, and with positive success at the box office, it finds itself in a nice place looking forward to awards season. This was one of my favorite films of the year (so far), so I'm glad to see it continuing to do well at the box office. Another film that keeps chugging along, and in second place this weekend, is "Hotel Transylvania". This is amazingly the fifth weekend for the film, and it's remained in the top three spots for each of them. It made $9.5MM this weekend, bringing its domestic gross up to $130MM, and its worldwide gross up to $220MM. The film still has about $45MM to go to catch "Cloudy With a Chance of Meatballs" as Sony Animation's highest grossing fully animated film of all time (in terms of worldwide grosses), but it's already bested it domestically with its totals this weekend. The film carries an $85MM budget, but that was already a non-issue weeks ago. The film still sits behind a few other animated films for highest gross of this year, but nonetheless, it's been a huge success for the studio. In third place we finally see our first new release in that of "Cloud Atlas". On Thursday I mentioned my uncertainties with how much this film could make in its first weekend, but ultimately I figured as long as it could break the $20MM mark, it would be enough of a success. Well, with only $9.4MM, it wasn't even able to break $10MM. For most, we'll consider this a huge disappointment for the film, and it's hard to figure how this film did as bad as it did with all of the marketing efforts behind it. I'll save my theories and thoughts for our upcoming edition of the CinemaCast (which you can hear on Tuesday), but for now, the fact that the film failed so terribly is unfortunate to see. Again, I'll save the majority of this for the CinemaCast, but while I'm not sure if it was one of my favorites of the year, it was definitely ambitious and extravagant; worthy of a watch, and it's a shame so few choose to give it that. The film has an estimated budget of $100MM, and if it's to break that number now, it would take something of a miracle. In fourth place, another holdover, "Paranormal Activity 4". This was the second weekend for the film, and on Thursday I alluded to the massive drop-offs from first to second weekends for these films, and sure enough, this one provided the worst of the entire series, dropping off more than 70% from last week's totals. It still managed $8.6MM, bringing its domestic totals up to $42MM. The film has also made good money overseas in its short time so far, already compiling $48MM. That brings its worldwide gross up to just over $90MM in 10-days, and for a film with a budget of only $5MM, that's pretty nice. As of now, the film is still the fourth most successful of the franchise, but that should be expected after only two weeks. I'll be curious to see if this film can compile anything significant in the coming weeks, or if this was about it. Either way, it doesn't seem like much of a stretch to assume the film with hit the watermarks of $100MM both domestically and internationally, something the previous films have managed. In fifth was another new release, "Silent Hill: Revelation". The film made $8MM this weekend and actually tied with "Taken 2" for this spot (as of right now at least - we'll see official numbers tomorrow). I give the edge to this film though, because I expect it will end up just ahead of "Taken 2"'s totals. $8MM was about half of what I figured this film would make, if for nothing other than the built-in video game fanbase for the franchise. Apparently most of them thought this looked just as bad as I did though and gave it a pass. With a budget of only $20MM, the film shouldn't have many troubles making its money back, but it probably won't make much more. If the first film, "Silent Hill", is any indication, that one made half of its entire domestic gross in its opening weekend. That would mean we're looking at something near $16MM for this one, but I assume it can do at least a little better than that. Outside of the top five, it seems notable to mention "Chasing Mavericks", another new release, which only made $2.2MM in its opening weekend. I expected this one to struggle finding an audience, but $2MM is rough. With a $20MM budget, even that will be near impossible to touch. We'll see if this one can manage anything internationally. "Pitch Perfect" surpassed $50MM this weekend and "Looper" $60MM (doubling its budget), but those are really the only totals I see worth mentioning. I'm glad to see "Looper" do so well, that's for sure. It's now made over $135MM worldwide; not bad for an R-rated sci-fi film.